Durham, Bishop Auckland, Sunderland, Gateshead, Newcastle-upon-Tyne, Tyne & Wear, Washington, Darlington, Middlesbrough, The Lake District, Northumberland, Cleveland and will also travel further afield. In day or evening dress with a choice of two tartans, Ancient Lamont (blue and green squares with white lines separating) or Ancient Stewart of Appin (green and blue diamonds with white and orange lines). Derek is a full time experienced piper with a happy outgoing personality. Having played the bagpipes for many years he has played at countless functions throughout the country, enabling him to gain experience in making every event even more special with the unique effect the pipes create. Derek's pipes have added atmosphere to weddings, medieval banquets, anniversaries, christenings, opening of new shops and restaurants, fabulous cathedrals & churches, reunion parties in pubs to private celebration in homes. Derek has played at York Minster, Ampleworth Abbey, Ripon and Durham Cathedral's and the Houses of Parliament. Among others he has entertained Sir Gordon Banks, Ian St. John, Nobby Stiles, Gladiators Hunter and Wolfman, Sir John Hall, Tony Blair and the Duke and Dutchess of Kent. 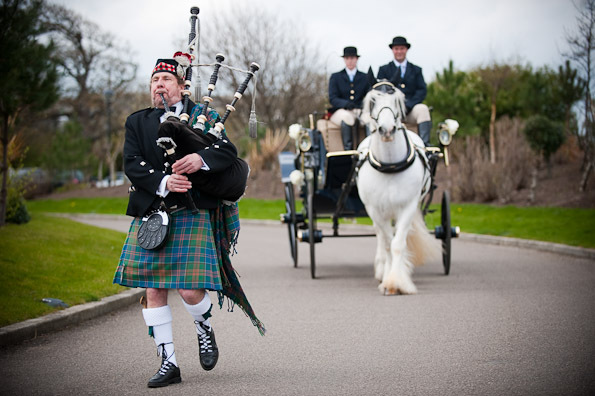 Derek is a dedicated, professional and entertaining piper and will make your event memorable and extra special.